The splendid Minami Boso area in Chiba Prefecture can be reached in about two hours by train from Narita Airport. Close to Tokyo, this vacation spot boasts many unique things to enjoy, from fresh seafood to hot springs and hidden scenic spots. The southern Chiba Prefecture area has been known as Minami Boso historically. It is filled with rural charms while being a suburb of Tokyo. This region is located at the southern tip of the Boso Peninsula, so visitors can enjoy fresh seafood, coffee breaks with ocean views, and bathing in the onsen (hot springs). Those heading directly to Tokyo from Narita Airport will be missing a unique experience, so if you want to enjoy nature or fresh seafood, consider the Minami Boso area. This article introduces several spots in the area, and also in Ichihara City in central Chiba Prefecture. This area filled with gorgeous nature and lesser-known destinations. The following list contains six recommended spots travelers should consider visiting. Yoro Valley (Yoro Keikoku) is a famous place to view the autumn leaves. Every fall, the valley is painted red, drawing many visitors. Awamata Falls, one of the largest waterfalls in the prefecture, offers a magnificent view alongside the autumn leaves. There are riverside hiking trails along which you can enjoy the changing seasonal scenery. The valley is also an area for hot spring resorts, with more than ten lodging facilities which provide travelers with rest after a day of exercise. off at "Awamata no Taki" bus stop. Route 2: From Narita Airport, it will take about an hour and a half by taxi or a rental car. Kominato Railway operates 39.1 kilometers between Goi Station in Ichihara City in central Chiba Prefecture and Kazusa-Nakano Station in Otaki of the Isumi district. Passengers on the Satoyama Torocco, a tramcar which starts running in mid-March, can take in views of the yellow colza flower field in full bloom. Riding the Satoyama Torocco requires an advanced reservation. Please check the official site. which is the first station on the Kominato Railway. The train ride takes about 25 minutes from Chiba Station. Isumi Railway runs approximately 27 kilometers, through fourteen stations from Ohara Station in Isumi City to Kazusa-Nakano Station. The flowers along the railway offer a fantastic view, especially in spring, when cherry blossoms and colza flowers bloom. first station of Isumi Railway. The ride takes around 1 hour and 10 minutes from Chiba Station. Mt. Nokogiri (Nokogiriyama) is a major sightseeing spot in Chiba, appearing on the cover of many guidebooks. Visitors can hike up the steep mountain, or use the ropeway. Even Mt. Fuji and Tokyo Skytree can be seen from the mountaintop. This area used to be a quarry where the precious stone, boshu-ishi, was excavated. This stone was used at various sites such as Yasukuni Shrine and Waseda University. Hikers will be able to see hints of this history during the climb. Nihonji, a Buddhist temple, is located on the south side of the mountain. Visitors can also see the huge stone images of the Buddha and Kannon (the Buddhist deity of mercy). Those who are not afraid of heights should try the Jigoku Nozoki from the observatory at the mountaintop. While looking down on the stunning view from this spot you can also see Mt. Fuji and Tokyo Bay. Required Time About two hours. walk from Hota Station. From Hamakanaya Station, it will be an eight minute walk to the ropeway. From Narita Airport, it will take about eighty minutes by taxi or a rental car. Price Adults: 600 yen/ Children (4 - 12 years old): 400 yen. A separate fee for the parking lot is required. Another popular spot is Katsuura Morning Market, which opens at 6:00 and offers fresh seafood. This is one of the three major morning markets in Japan, along with Wajima in Ishikawa Prefecture and Takayama in Gifu Prefecture. Dishes made by locals and groceries are also sold at the market. There are around seventy shops where visitors can enjoy conversing with the owners. Asaichi Dori (open every month from the 16th to the last day). Fixed holidays Wednesdays and January 1. Access From Narita Airport, take the JR Narita Line to Chiba Station, switch to JR Sotobo Line, and get off at Katsuura Station. It is a ten minute walk to the market. Those who want to escape bustling urban areas and enjoy an ocean view should go to Ubara Utopia. In the Taisho Period, there was an initiative to build vacation homes in the area, which resulted in it being called a utopia. This is a spot of scenic beauty that is not well-known, even to people living in Japan. Visitors can take a stroll and feel the refreshing sea breeze. Access Seven minute walk from Ubara Station. It is a ten minutes by foot from Ubara Utopia to Katsuura Undersea Park, which features a tower observatory located sixty meters from the shore. Visitors can view the ocean from the top of the tower, and also enjoy seeing fish from the windows underwater. This is a spot amusing for all ages where guests will be entertained watching the different fish that come and go depending on the season. Fixed holidays There are no closed days. The center may be closed due to weather conditions. Access Fifteen minute walk from Ubara Station. Trying different food is an important part of travel for many. Check the Minami Boso cuisine listed below and taste some unique dishes. Hokkaido may be famous for its seafood, but the Minami Boso area receives many travelers drawn to the delicious fish here. The seafood from the Sotobo area on the Pacific Ocean side and the Uchibo area on the Tokyo Bay side differ, and visitors can taste them at a more reasonable price compared to Tokyo. Lobster, yellowtail, abalone and alfonsino are caught in the Minami Boso area. You may become addicted to the hot, delicious taste of Katsuura tantan men (spicy noodles), well-known as B-grade gourmet cuisine. A special chili oil, along with shredded onions and pork is added to the noodles in a soy sauce-based soup. This dish was originally made for the local ama (female diver) and fishermen during winter, to help them warm up after a day of working outside. In 2015, it became famous after winning the first prize in the B-1 Grand Prix, a competition of B-grade gourmet dishes from all over Japan. Each restaurant uses a different variety of chili oil, noodles, and seasoning so you can enjoy trying multiple bowls. Chiba is famous for peanuts. In fact, around eighty percent of Japan's domestic production is in this prefecture. There are many dishes, sweets, and souvenirs made with peanuts, offering a wide variety of items for visitors to choose from. Peanut cream spread is a product made from high-quality peanuts. You can find sweetened, sugar-free, crushed or smooth types. Try the sugar-free type, which has a nice fragrance and a velvety texture. 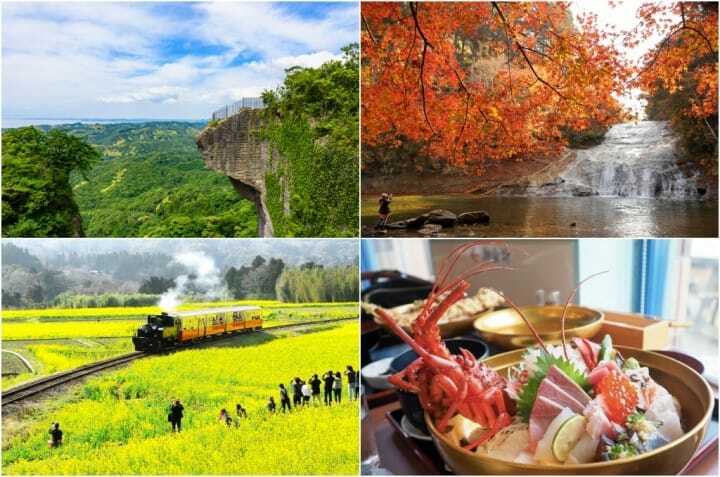 There are many destinations in Chiba Prefecture where visitors can get away from the crowd, bathe in hot springs, taste fresh seafood, and enjoy a magnificent view. After arriving at Narita Airport, venture to Chiba for a special experience. Enjoy Chiba's Rural Scenery Aboard A Vintage Train! The Hidden Delights Of Chiba Prefecture's Delicious Food Revealed! 4 Onsen Hotels Near Narita Airport: Enjoy Chiba's Seafood And Great Scenery!